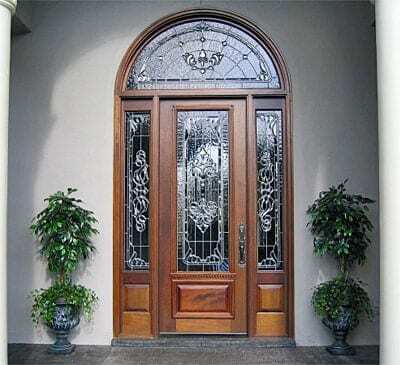 This beautiful Front Entry Door is found in the Beauvoir Subdivision in Montgomery, AL. This Custom 36″ x 96″ “C-2″ Door is enhanced by the two 14″ x 96” Sidelites, all of which have Custom Beveled and Textured Leaded Glass. 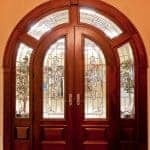 The Radius Transom above has a complimenting Custom Beveled and Textured Leaded Glass to make this entryway shine. The hardware shown is Baldwin Monterey. Let us make your entryway shine!